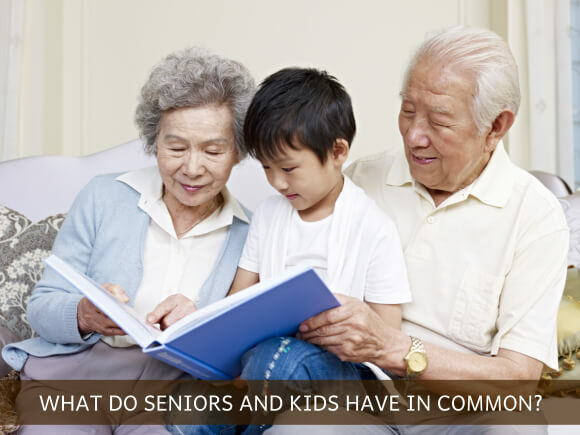 WHAT DO SENIORS AND KIDS HAVE IN COMMON? Seniors and kids came from different generation. They have different interest in life. Seniors tend to focus more on “adulting” kind of life, while kids are still in bliss and innocence. Despite the diversity, interestingly they have commonality. Special care. Kids and seniors should be guaranteed with a delicate type of care. Kids especially toddlers are still in constant body development. They have to be guarded off to avoid stumbling down from the crib or playground. Seniors on the other hand need the same care because their muscles are already weak. They are already past the calendar; hence physical frailty is definitely their main issue. Prone to diseases and immune system issues. Because kids unmindfully touch various things they are curious about and depending upon their genetic make- up or immunity, they can be prone to various diseases if not well-guarded by their parents. They can catch common colds, pneumonia, etc. Seniors’ immune system has been degraded by years of constant stress. Different health concerns come out like cataract, cancer, hypertension, diabetes and other life-threatening disease. Needs cognitive, physical and emotional development. Kids are undergoing cognitive development as they try to utter words, understand other’s thoughts and communicate effectively. They need to be physically developed to grow and hit puberty soon in a good way. They also need emotional development to impede and control tantrums they usually do in public places. Seniors have once attained these types of development but due to aging, gradually everything is deteriorating. Hence, with constant therapy and help from health care professionals, they hope to regain cognitive skills, physical and emotional stability, and independence. Full support group. No man is an island. Kids have parents to support their daily engagement for improvement and utilization in the future. Seniors also have children and loved ones willing to give support in this difficult transition. Through financial support, they can hire medical/non-medical team to make sure seniors are well taken care of at home. In a nutshell, kids and seniors need special care because they are delicate to handle for their age. Hence, if they have health issues, rely on the services of OptimumCare Home Care Services. Our non-medical home care in Opitz Boulevard Woodbridge VA does Personal Care, Companion Services,Live-In Home Care, and many more. Further, ournon-medical home care in Opitz Boulevard Woodbridge VAguarantees the finest care you can get for those you love. Visit our non-medical home care in Opitz Boulevard Woodbridge VAto see for yourself our great environment well-crafted for our clients. Also, check our website for more details. Did you find this blog helpful? We encourage you to leave your comments below.